La Posada Hotel, Winslow, AZ. Louise Speaks: While in Winslow, we decided to check out the La Posada Hotel, a place I have heard many of our friends have visited. It’s amazing when you think of the size of Winslow having two attractions of this caliber. La Posada embodies the visions of both Mary Elizabeth Jane Colter, the hotel’s renowned architect, and Allan Affeldt, its current owner. But the story really begins with Fred Harvey, who “civilized the west” by introducing linen, silverware, china, crystal, and impeccable service to railroad travel. He was so legendary that MGM made a movie called The Harvey Girls starring Judy Garland. In the 1920s, Harvey decided to build a major hotel in the center of northern Arizona. “La Posada”—the Resting Place—was to be the finest in the Southwest. Construction costs alone exceeded $1 million in 1929. Total budget with grounds and furnishings was rumored at $2 million (about $40 million in today’s dollars). They chose Winslow, then (as now) the Arizona headquarters for the Santa Fe Railway. Winslow was ideally situated for a resort hotel since everything to see and do in northern Arizona is a comfortable day’s drive away. Colter worked for the Fred Harvey Company from 1905 until her retirement in the 1950s. 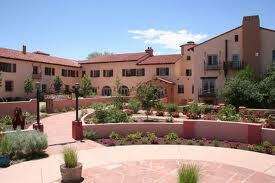 Although famous for her magnificent buildings at the Grand Canyon, she considered La Posada her masterpiece. Here she was able to design or select everything from the structures to the landscape, furniture, maids’ costumes, and dinner china. Many people consider this the most important and most beautiful building in the Southwest. La Posada www.laposada.org/ opened May 15, 1930, just after the stock market crash of 1929, and remained open for just 27 years. In 1957, the hotel closed to the public. The museum-quality furnishings were auctioned off in 1959. In the early 1960s, much of the building was gutted and transformed into offices for the Santa Fe Railway. Several times over the ensuing 40 years, the building was nearly demolished, as recently as 1994 when the railway announced its plans to move out for good. The National Trust for Historic Preservation found out about La Posada’s peril and added it to their endangered list — where it came to the attention of Allan Affeldt. But La Posada was never for sale. Allan Affeldt purchased it from the Santa Fe Railway after learning that the property was in danger. He visited the hotel in 1994 and decided to help local preservationists save it. This daunting task entailed negotiating for 3 years with the railroad and resolving various legal, environmental, and financial obstacles. He established La Posada LLC to take on the enormous risk and complexity of the estimated $12 million restoration. Although none of the partners is a hotelier by training, they have accomplished what once seemed impossible—transforming a forgotten but magical place into a living museum. Each room at La Posada is unique. Many rooms feature handmade Ponderosa pine beds designed by master carpenter Keith Mion. 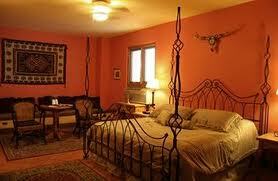 Handwoven Zapotec rugs and Mexican tin and Talavera tile mirrors adorn the walls. A number of rooms feature original 1930 B&W mosaic tile bathrooms complete with 6-foot cast-iron tubs. Other rooms feature new custom Talavera tile bathrooms with whirlpool tubs and hand-painted tile murals. There are views into the Sunken Garden, into the Cottonwood Grove, across the South Lawn to the Santa Fe railroad, into the Potager Garden, and across the north gardens to Route 66. Rooms are named after famous people and can be reserved by name. The Howard Hughes room is a delux suite while the Roy Rogers room is concidered a standard room. Rooms range in price from $109.00 for a standard room to $169.00 for a delux suite. Walking through this hotel and it’s gardens was like stepping back in time. It did appear more like a museum than a hotel, but I’m sure with the serenity and peacefulness of it’s surroundings, it would make for a great weekend getaway. Of course this hotel was not in Patricia’s book “1000 Places To See Before You Die” but it does seem to be quite an impressive piece of Arizona history. This was our last stop…19 days and over 3500 miles…what an adventure. We have now completed the state of Colorado per Patricia’s book. Tonight we sleep in our own beds and rest before going back to work. Thelma Speaks: As you walk into the La Posada Hotel you have to wonder what it was like back in 1930. As you walk through the halls you wonder who has walked there before and what their thoughts were back in the 30s. The halls are all decorated with the southwest flare. Being on the patio you can watch the railroad tracks in front of you and think of how it was in the 30’s to get off the train in the southwest and have a hotel of this kind to relax and stay a while before continuing on your way to California. Parts of the La Posada seem more like a museum but after all, there is a lot of history between these walls. I think it would be a great getaway if you wanted to stop and relax in a more peaceful setting. This hotel is not in Patricia’s book but it is a part of Arizona history and should be recognized for its part in the building of the west! Categories: Arizona, Historic Sites, Hotels | Permalink.